Well, we're up in Broke this weekend - spending some time with Jeremy's family. I'm not sure how long this post will be because Calvin has been due to wake up for a feed for about half an hour now, so i'll just blog until he does, then press the post button! Yesterday was a bit stressful - travelling from Wollongong to Broke. We didn't get to leave until about 11 due to Calvin messing around a bit with his feeds in the morning, and then he slept until we got to Sydney (at the end of the M2 - in the stretch of Sydney between the M2 and the F3). We stopped at the maccas for lunch, and i fed Calvin there. Got back into the car and Calvin was all good until we got on the F3, where he proceeded to scream his lungs out. I was driving so Jeremy was reaching over the back putting the dummy in and trying to calm him down. Nothing worked, so we ended up pulling over at the rest stop on the Moony Moony Bridge. Took us about half an hour to calm him down. We had planned to stop in at Newcastle to catch up with Chelsea and then Jeremy's grandparents, but by this stage, our stop by Newcastle was definately off. We ended up arriving at Broke at about 4:30 - just in time for Calvin to have another feed. In other news, Calvin has started sleeping through the night!!! He slept through for the first time last Thursday night. We've since had 5 full night's sleep, though the last 2 nights he woke for a feed. Hopefully he'll sleep through again tonight, but God only knows what he'll do!! It's funny how you just can't predict these things - like him having a long nap this arvo! So, onto scrappy business, i've done a few pages recently - all of Calvin of course!! 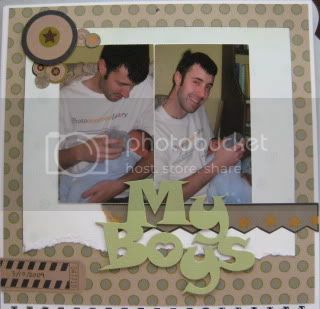 Here's one i did for the Scrapboutique November Stash Stomper competition. 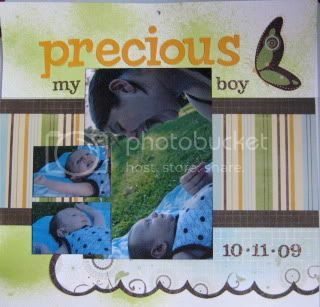 I've used glimmermist to create the effect on the middle green square - masking with a chipboard piece which i've included on the page. The PP are all Sassafrass Lass, and the flowers are Prima. Alphas are Basic Grey and the bling is Kaiser. 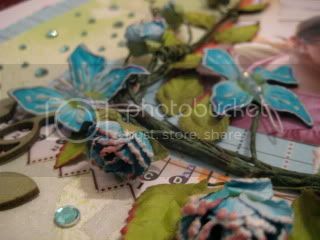 The next page was created for the Scrapboutique November CC Sunday Roast. 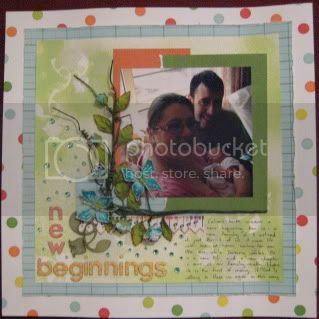 I've used some yummy Stampin' Up! 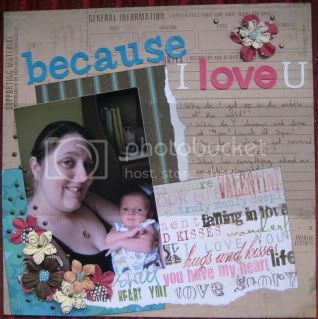 PP, along with some thickers for the alphas, some Pink Paisley chipboard and some Stampin' Up! punches. Cool hey?!?! This is my favourite colour combo - raspberry and chocolate - sounds good enough to eat doesn't it?!?!! 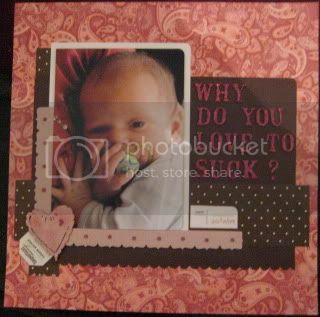 The next page was also created during the Scrapboutique November CC - during Chelsea's friday night speed scrap. I've used some of the delicious new Bo Bunny PP's and diecut stickers, on a Basic Grey background and i've added a little Heidi Swapp. In other news - i've been published!!! You can find my first published page in the November issue of Creating Keepsakes - at the back in the 'Australian Scrapbookers' section. Well, Calvin's still asleep, but i've said pretty much all i need to say!